BITtelligent has been fairly singularly focused when it came to CRM software we sold and supported. For as long as we have been around and before our identity was closely tied to SalesLogix/Infor CRM. For so many years we have been in the ecosystem. Working as a partner, vendor, internal team member, and external contractor its all been a great time. There has been ups and downs with the product and relationship at various times but I can count it as the technology company and partnership that has had the second greatest impact on my life and career success. Only Microsoft has had a greater impact given the tools, contracts and life that has been built off the windows tech stack. I’d like to thank both companies for the success we have had. Its not always been easy but I am far more blessed then so many others. Now we continue to be very aligned to Infor, Infor CRM and now Infor CRM CE. Its a strong relationship with a great development team and I am looking forward in not only seeing what is coming next, but also working with the team to build what is coming next. BITtelligent renewed our partner agreements with Infor and look forward in continuing our rich history. Interestingly enough as we are in the market we discover more and more that one size does not fit all. Each customer has a level of requirements, processes, users and budgets that can make Infor CRM prohibitive as a solution. For example moving to cloud with Infor CRM there is a minimum user count that can be made for a deal. This minimum does not count for on-prem licenses but that is indeed another conscious decision that would have to be made with regards to hardware costing. To this end BITtelligent has signed up for 2 additional CRM products. Thought they are new to BITtelligent they are not new in the CRM landscape and have been proven and can be very cost effect for the SMB market. This week BITtelligent signed up to sell and support both BPM’Online and Act. Both platforms fit well into the skills and capabilities of the BITtelligent team and utilize technology stacks that we know well. Both products also have the same hosted/non-hosted capabilities giving the customer the ultimate control of where they would want their data to exist. Over the next couple of weeks we will be going through the on-boarding process to ensure that we have the right knowledge and skills to provide the professional services and support to make all of our platforms winners regardless of the choices customers need to make. This week the long awaited update for Infor CRM was released. The release contains quite a few fixes which in most case would make it a no brainer to upgrade to. That being said Infor has changed their support policy for cloud based customers to now disallow direct access to the CRM environment after 8.4.0.1 has been installed. As such the openness of creating reports and managing the environment, including promoting customizations will become more complex and require more effort from the partner, and customer CRM support from making changes to the environment. If you do need to create many reports, or in the midst of a larger development effort it may be in your best interest to hold off on the 8.4.0.1 upgrade to manage any impacts. If you have any question do not hesitate to reach out to your partner, or Infor Support for more clarification or to create a plan to lower the impact of the change. Now if you Infor CRM environment is not hosted in the cloud then moving to 8.4.0.1 is our recommendation. One of our customers required posting quotes from Saleslogix into MAS. Though the transaction type was available it was not possible to actually post anything except for a standard order. It seems that the spSOApiSalesorderIns stored procedure had a fixed transaction type of 801 (order) where as quote would have needed a value of 840. We have updated the stored procedure to now accept a transaction type (801, 840) and when selecting either an ‘Order’ or ‘Quote’ the correct type will be passed down and processed as expected. This updated will be in the next version of ERPLink 2014. I’ve been working on a update to Dynalink 2014 and sometimes the smallest changes mean the most. 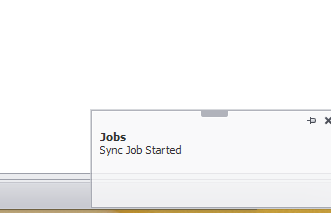 Dynalink use to show each of the jobs in separate windows for each configuration. The more I thought about it the less it made sense. The window also would show some internal ids (task and map id) which does not actually make sense for a customer facing view. I have updated the window to now consolidate all running jobs on a given server and changed the columns to make more sense. 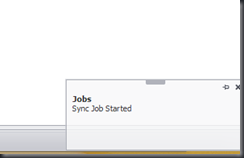 I have also moved the stop job menu item from the configuration list to the job status list. I have been playing around with the notion of making some of the notifications less intrusive. The one place that I was not happy about was when a job was started from the Administrator. When started a a modal message box was displayed that the user would have to close to continue on. Though not a bad thing I was annoying me enough that I wanted it changed. As such we have added a Toast Service to our architecture that can be called in place of some of the dialog popups to remove the extra step of closing a status dialog. BITtelligent Software and Media, Inc.